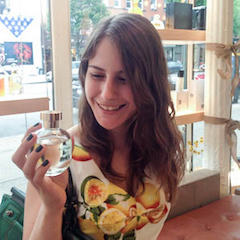 The talented, exquisite Victoria Frolova of Bois de Jasmin is my perfume blogging role model. Victoria has been publishing her characteristic lush, poetic perfume reviews since 2005. Bois de Jasmin has won a FiFi for Editorial Excellence and has been mentioned in Vogue and The New York Times. Her perfume writing soon caught the attention of International Flavors and Fragrances (the third largest fragrance firm in the world), where she received her initial perfumery training. Victoria also looks remarkably like Christina Ricci. Some girls have all the luck! 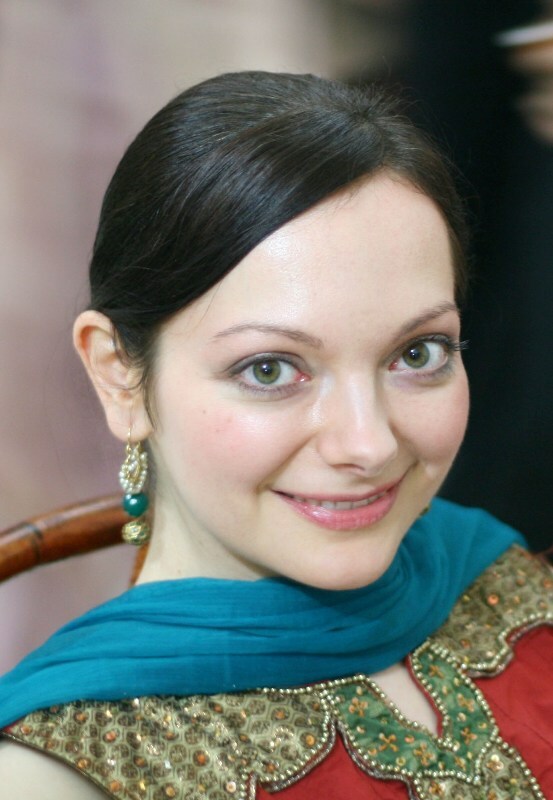 It is an utter pleasure to share Victoria’s fascinating insights about her perfumery training with you today. So many reasons! Because smelling something beautiful makes me happy, and I love sharing. Because I believe that being more aware of scents can enrich one’s life tremendously. It is not just about perfume in the bottle, but about perfume in a more general way—being mindful of scents when eating, drinking, walking down the street. The more one is attuned to smells in one’s surroundings, the more one can appreciate simple pleasures. It is fun to taste a cherry and find that it has a clove-like nuance. Or to smell blooming magnolias and find that their fragrance is reminiscent of lemon ice cream. All in all, I write about perfume for the love of it. You’ve told us on Bois de Jasmin that you have received perfumery training at IFF (International Flavors & Fragrances). What can you tell us about your perfumery training? At first, one is required to memorize a palette of odors, 300 to 400 of which require intimate familiarity. Then one begins working on basic accords such as rose, lily of the valley, tuberose and amber. Different schools structure their training differently, but generally duplications of fragrances on the market (classics and trendsetters) form an important part of learning the art of fragrance composition. It is similar to what student painters do when they copy the works of the great masters. Once one understands the basic principles of fragrance construction, one is allowed to create by oneself. At the same time, because a perfumer today needs to be well-versed in different areas of perfumery, one learns how to make candles, fabric softeners, liquid detergents, how to transform a scent for an alcohol based perfume to a lotion, how to reformulate, how to reduce the cost of an expensive formula. When I first started in the course, I would come home after 8 hours of smelling feeling as if I had spent my day lifting bricks. It got much easier as time went on. Learning about fragrance creation made me realize how incredibly hard it is to come up with an original and distinctive composition. It is a humbling experience. I love classical fragrances from Guerlain and Chanel, because they have a rich, voluptuous quality which is not commonly found today. On the other hand, they are not dated, which is not necessarily the case with all fragrances from that era. I feel the same way about Estée Lauder (Private Collection, Aliage, and Knowing are my favorites.) I also enjoy fragrances from Annick Goutal, Serge Lutens, Kenzo and Parfums de Nicolaï. Online stores such as Aedes, Luckyscent and The Perfume Court for samples and decants. Otherwise, I love Sephora, the layout of which is great for leisurely sampling, and T.J. Maxx for bargain hunting. At seven years old, Bois de Jasmin is one of the oldest perfume blogs. How have you managed to maintain your interest in perfume and to keep writing about the same subject for so long? I find the topic enjoyable and fun, and a beautiful scent makes me as happy and excited today as it did when I first started Bois de Jasmin. Above all, the exchange with the readers and other bloggers is very rewarding because every day I learn something new thanks to them. Dancing, cooking, reading, photography, traveling. I am a curious person by nature, so I always have some new quest. Spending time with my family is my number one priority, however, especially since both my husband and I have busy schedules. We share many interests in common, and on weekends we often plan some activities around them. What perfumes were you hoping to find under the Christmas tree/Menorah branches this year? I would have loved a bottle of Chanel Coromandel. I used up a few decants of it already, so I know that it is not just a momentary infatuation. Next ›More Info on The Top 20 Project! Victoria is W-A-A-Y prettier than Christina Ricci! It’s nice to see the face behind one of my favorite blogs. She is so young to be so knowledgeable. I enjoy her posts about food and recipes as much as those on perfumes and individual notes. Patty, Ari, you are making me blush! I’m so happy that you enjoy my food posts. There are many excellent cooks in my family, and my MIL even taught cooking classes after she retired, so I have plenty of inspiration. The side effect of perfume obsession is that I feel so much more confident in trying new flavor pairings and experimenting. And if I had to give up my collection of spices, I would be probably feel more heartbroken than if I had to give my perfumes. I have a question for Victoria, if she’s willing to answer it … how many bottles of perfume do you own? I want to know the answer to this, too! Elisa, I honestly have no idea, because I am not very systematic about keeping a track of my perfume bottles. I can tell you that I own way more books than perfume bottles. That’s for sure! I have stopped buying full bottles of perfume some time ago, mostly because of space and storage issues. I have to keep a complete fragrance library on hand for study and work, but I usually make do with just decants and samples. It makes things simpler. Thank you, Ari! It was so much fun to do this, and you are a great interview partner. You know, I cannot believe that I have been writing Bois de Jasmin for 7 years. It really doesn’t feel that long. When you pointed it out, I was almost shocked. I love Bois de Jasmin, especially the perfume reviews and articles talking about different scent families and perfume styles. However, I do feel a little defective because Victoria adores Lancome’s Tresor, but it always smells like Cabbage Patch dolls to me and I can’t get on board. Honestly, I bet Cabbage Patch dolls smell like Tresor, but I was exposed to the dolls first. Bois de Jasmin and Scents of Self are the only blogs I visit everyday! I am incredibly flattered, Jenn, thank you! I always found cabbage patch dolls a little creepy, so I can’t comment on the smell! I know! She could fit in my pocket!!! It was great to get “up close and personal” with Victoria, whose blog has been a guiding light since I first got into perfume four years ago. I cut my teeth on NST, PST and BDJ, even though it doesn’t end in -ST. I had no idea Victoria had had that formal perfumery training, but it makes absolute sense, given the detailed desconstructions of the scents she reviews. I dream that someday I too will be a former perfume blogger turned actual perfumer! Thanks for this link, which shows it pays to tab-hop sometimes – there is a lot of good info tucked away! How lovely to meet Victoria! I’ve enjoyed her blog for several years now, and I always enjoy her reviews, which somehow manage to combine scientific understanding of structure with lyrical description. It’s quite a feat. And I also have her to thank for my love of La Myrrhe. I’d be interested to know – is that beautiful set of clothes she’s wearing in her photo Indian? So intricate. And gorgeous color combo. I’m so happy that you love La Myrrhe too! It is one of the gems from SL. The tunic is Indian made, you’re right. This is not a wedding photo though–I look far too relaxed! 🙂 Lately I noticed that I have too much black around, so I’m rebelling with bright colors. Thank you and everyone for your kind words. You’ve really touched me. Being a part of the blogging community is very special and it is the best part of having started BdJ in the first place. So many friendships and great encounters. Here is to many more in the future! Thank yor for the wonderful interview. I too visit Victoria’s blog every day and am always learning from it. Victoria’s writing is beautiful, enlightening, and generous. I have to go to TJ Maxx and Marshall’s at least every few months to hunt for those rare bargains, too. I’ve found some gems there way underpriced. Loved the interview, Ari. I think there isn’t a single Estée Lauder perfume that I don’t love, like or simply respect. ah, so a vintage one!!! 🙂 do you wear it often…? I’ve tried so hard…! just too strong powdery patchouli on my skin, but I still admire its merit and the potential beauty in someone else! Thank you both, Ari and Victoria, for the great interview, reading more about the formal training made me both wishing I could get it and being happy I didn’t do it: it seems like A LOT of work.